Do you have a wet, moldy basement or crawl space? Best Home & Property Services specializes in crawl space repair and encapsulation, sump pump installation, and basement waterproofing in South and North Carolina. We take pride in transforming damp, rotting crawl spaces and flooded basements into dry, usable space. In fact, it's what we do every single day! In business since 1962, we have many years of experience and know what it takes to get the job done right. All of our technicians are trained to install the products your home needs. And no matter how big or small your basement or crawl space water problem might seem, there's a good chance we've seen it - and solved it - before! Repair cracked, damaged concrete with our proven system! As a part of the Basement Systems and CleanSpace dealer networks, all of our basement waterproofing and crawl space repair products are created by industry experts who never tire of innovation. These products have been used by hundreds of contractors in thousands of homes across the country. Through these networks, we have the support of all of these contractors and specialists - and we pass these benefits on to you in the form of exceptional service! We also include a full written warranty with all our waterproofing and moisture control installations. Because we are a local, family company, customer satisfaction and well-being is extremely important to us, and we want you to feel good about your decision to work with us. We'll be there whenever you need us! Local homeowners have grown to recognize us for the dedicated, attentive service we provide. We listen to your needs, answer your questions, and always do what we say we are going to do. And if any problems arise in the future with your crawl space encapsulation products or basement waterproofing system, you know you have a contractor to call. Check out our testimonials and see what customers have to say! Don't wait to enjoy a dry crawl space or basement. The problems you're currently experiencing will only get worse over time, and there is simply no reason to live with a moldy, humid home. 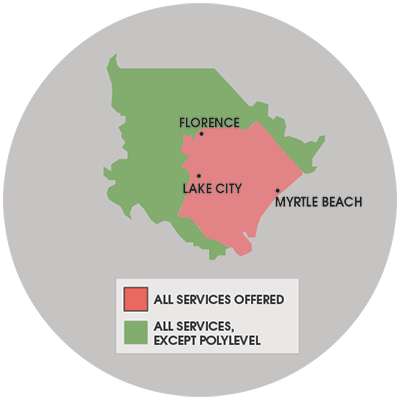 We offer free estimates to residents in Florence, Myrtle Beach, Sumter and throughout the surrounding areas - schedule yours today!